CryptoNote Technology: What is CryptoNote and How Does it Work? CryptoNote is a technology that is designed to be an improvement for modern cryptocurrencies such as Bitcoin, Ethereum, and Litecoin. The underlying technology of CryptoNote is very similar to that of many standard cryptocurrencies. With that said, there are also a few major differences between CryptoNote and the underlying technology behind many other digital currencies. The most important of these differences is that CryptoNote technology is designed to be more private and anonymous than traditional cryptocurrencies. CryptoNote technology uses a universal open-source public ledger like Bitcoin. However, unlike the blockchain technology that powers many other cryptocurrencies, CryptoNote currencies make it essentially impossible to tell which party sent money and which party received money on the blockchain. All that can be seen is an approximate amount of money that was sent in the transaction. CryptoNote technology also relies on a hash-based proof-of-work algorithm that is significantly different than that of Bitcoin and other popular cryptocurrencies. Unlike Bitcoin, which uses an SHA256 system, CryptoNote uses a memory-bound function called CryptoNight. CryptoNight makes it a lot more difficult for miners to use ASIC devices to boost mining power. This can help mining to remain a lot more distributed, as opposed to centralized. The algorithms behind CryptoNote technology also enable protection against double spending, blockchain analysis resistance, egalitarian proof of work, and adaptive parameters. Essentially CryptoNote technology works by being a cryptocurrency protocol that approaches certain features differently in order for the currencies that rely on it to be even more “crypto” than other cryptocurrencies. There are a number of cryptocurrencies in existence today that use the CryptoNote technology, despite the fact that it is just a few years old. 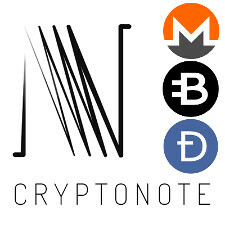 The most popular cryptocurrencies built with CryptoNote include Monero, Bytecoin and Karbo. Of the three of these, Monero is the most popular and well known. As of December 2017, Monero had a market cap of about $4,873,692,247 USD. The price of one Monero coin was $314.80 and XMR was the 11th largest cryptocurrency in the world by overall market cap. As a comparison, at the same time Bytecoin was the 31st largest cryptocurrency in the world by overall market cap, had a total value of $533,102,858, and costed $0.002909. Even though Monero is larger and more popular than Bytecoin, both cryptocurrencies are relatively high up in the pecking order for cryptocurrencies. Of course, they are both still far below behemoths like Bitcoin, Ethereum, and Litecoin. However, if increased privacy is something that grows in demand, then both of these cryptocurrencies could rise in popularity. Why is Privacy So Important with Cryptocurrencies? Privacy is something that has been desired by many cryptocurrency users since Bitcoin was first introduced. There is a variety of reasons why people value privacy when it comes to cryptocurrency. Some value it because they are very wealthy and want to hide their transactions to avoid being targeted for hacking. Others value it because they believe it gives them a competitive advantage for business. Privacy is also valued by liberty loving people who simply do not want the government or anyone else tracking their spending. Many of these people believe that private currency transactions are a right that people deserve. The level of privacy that CryptoNote technology provides is far superior to standard fiat currencies or even other cryptocurrencies. Fiat currencies are easy to track because they often leave paper trails. This is especially true when purchases are made online, with credit cards, or with checks. However, many cash transactions can be difficult to track. Standard cryptocurrencies like Bitcoin offer more privacy than fiat currencies do. Their privacy, however, is limited because cryptographic identities are revealed with each transaction on the blockchain. This means it is possible to see which account sent money to another account with cryptocurrencies like Bitcoin. The cryptographic identities still need to be decoded, which is a large challenge. However, it is possible. With Monero, and other Cryptonote technologies, discovering the identity of people making transactions is the cryptocurrency is much, much more difficult, if not completely impossible. Is Privacy Always a Good Thing When it Comes to Money? Considering that many transactions are now made over the internet, having cryptocurrencies that are based on CrypoNote can help to make transactions more secure. So, this is a very good thing. However, private cryptocurrencies also present major opportunities for criminals who want to keep their transactions a secret. This is a major potential problem for CryptoNote-based currencies. Anonymous transactions being done by the wrong people can make easier for drugs, weapons, and other dangerous substances to be transported around the world, and make it more difficult for law enforcement agencies to catch criminals. Because cryptocurrencies are often the preferred method of payment on dark web sites such as the former Silk Road, there is an opportunity for law enforcement agencies to create sting operations on these sites using the cryptocurrencies to make transactions. This could be a new potential avenue for law enforcement to catch the criminals who create these sites and use cryptocurrencies like Bitcoin and Monero to make transactions on them. The CryptoNote technology is pioneering and is still just a few years old. This makes it very difficult to tell just how popular it will become. Judging by the soaring value of Bitcoin and many altcoins which do not use CryptoNote, it appears that the cryptocurrency market is very comfortable relying on the current blockchain technology. If a few high profile Bitcoin hacks take place in the next few years, then it is quite possible that coins associated with higher levels of privacy and security such as Monero and Bytecoin could rise in popularity and make their way higher up the cryptocurrency pecking order. If this happens, then it could trigger a domino effect in which new ICO’s start incorporating CryptoNote into their underlying technology. Ultimately, the market will decide just how popular CryptoNote will become. Alternatively, if it turns out that governments start having a lot of trouble with crime due to increasing levels of CryptoNote cryptocurrencies, then there could actually be significantly heavier regulations put on these cryptocurrencies. In some nations, they could even be banned outright. How Much Control Should Central Authority Have? CryptoNote technology brings up several philosophical and political questions. One of the most important of these is exactly how much control and oversight should governments have over the financial transactions of their citizens. It also forces governments to try to figure out how they would even regulate these currencies if they did decide to place stricter regulations on them. After all, the law enforcement is busy tracking the large amount of crime that already take place with dollars, gold, and other units of exchange, such as foreign currencies. Another question that is raised by CryptoNote technology is whether or not national fiat currencies are even good enough to function as widely used money any more. After all, if there were no problems with national fiat currencies, then cryptocurrencies probably never would have been invented. But, many people would argue that the fact that an infinite amount of dollars can be created at any time and then given to any large company who is in financial trouble is a serious flaw in a currency. This is because unlimited money printing has proven throughout history to lead to inflation and then hyperinflation. It is understandable that governments such as the U.S. government would want to be able to print out unlimited amounts of currency so that they can afford to pay for more things. However, doing so effectively reduces the value of every dollar held by every person with a dollar-based bank account. So, CryptoNote-based cryptocurrencies could serve an important role in providing citizens an alternative to inflation-prone national fiat currencies. It is possible that one day, CryptoNote-based cryptocurrencies, or other types of cryptocurrencies could become even more widely used than national paper-based fiat currencies. This would represent a paradigm shift. CryptoNote technology is a very important privacy breakthrough for cryptocurrencies. As of right now however, this technological advancement has not proven enough for cryptocurrencies that have it to overtaken the market leaders who do not. However, given the improved privacy that can be achieved with CryptoNote, it is even possible that one day, the main cryptocurrencies such as Bitcoin and Ethereum could implement it. Due to the first move advantage, it is difficult for other cryptocurrencies to catch up with the market cap that Bitcoin has already accumulated. Currently, Bitcoin’s market cap is $298,932,523,180. However, if anything is going to help other cryptocurrencies catch Bitcoin, it could be technological breakthroughs such as CryptoNote. For people who value privacy, CryptoNote is a very important breakthrough, and one that is very encouraging for the future of cryptocurrencies. For people who think privacy-based currencies are negative thing for society, CryptoNote technology may be seen as a concerning development. However, regardless of how you feel about it, CryptoNote is here to stay unless the government decides to make it illegal. The fact that cryptocurrencies have grown so popular in general, means that large numbers of people value cryptography and currencies that implement it. Seeing as how CryptoNote technology is the cutting edge of cryptographic currencies, it is possible that early investors in currencies that have CryptoNote could make substantial gains from buying currencies like Monero. But, if the government does decide to ban these currencies, then this investment could quickly turn out very bad. As with all cryptocurrency investments, there are substantial risks associated with investing in CryptoNote coins. This means that if you are planning to invest in CryptoNote-based currencies, then you should always practice caution and make sure that you only invest what you can afford to lose. Otherwise, you could find yourself deep in a hole that is difficult to get out of.